I do have a lot of plan for my room. Oh well, not actually my room as I am sharing it with the little one and my Mum. But if I am to buy something for the room as this point it would be a bedroom vanity set. I am a perfume and make up enthusiast so you will normally see them on my work station scattered as I don’t know where to keep them. Just recently I stumble upon a furniture online store that offers white bedroom vanity sets. 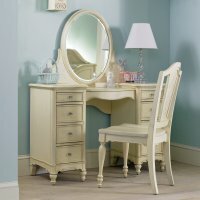 I find this vanity set simply yet elegant and classy. I wonder if I can find the same style or at least similar in one of the local furniture store here in our place.